The jumbo desktop calculator operates on battery power for convenience. Requires 1.5v AG10 battery (included). The jumbo desktop calculator is dual powered and operates on both solar and battery power for convenience. BIG DIGIT JUMBO CALCULATOR SOLAR BATTERY. Solar powered. Large 8 digit display. Jumbo Calculator. This battery powered Jumbo Calculator is constructed from durable plastic and features large easy to use buttons and a pop-up screen. COLOUR MAY VARY (BLUE,GREEN,RED,)8 Digit Display A4 Size Jumbo Desktop Electronic Calculator Battery Powered Black Large. 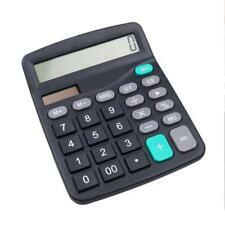 Desktop calculator use for general math calculation. Images shown are for demonstration purposes. Designed to tackle all mathematical equations. If you fail to comply with this obligation, we may have a right of action against you for compensation. Dispatched Within 24 Hours. Price £2.95. The jumbo desktop calculator is dual powered and operates on both solar. Desktop Calculator. and battery power for convenience. 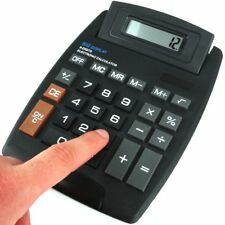 The jumbo desktop calculator is dual powered and operates on both solar and battery power for convenience. Requires 1.5v AG10 battery (included). 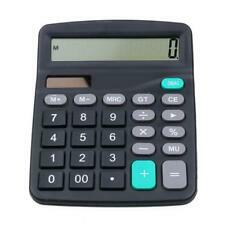 Multi-functional scientific calculator, nice helper for data dealers, improve your efficiency and accuracy! 1 Calculator. Also note that monitor settings may vary from computer to computer and may distort actual colors. 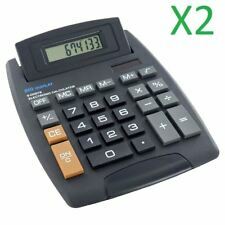 The jumbo desktop calculator is dual powered and operates on both. Jumbo Calculator. solar and battery power for convenience. Jumbo Home Office Desktop Calculator 8 Digit Large Button School Battery UK. Condition is New. Dispatched with Other Courier (3 to 5 days). Baby & Nursery. Jumbo desktop calculator is dual powered and operates on both solar and battery power. More features: 8 digit display, auto power off, pivoting display, square root key. Requires 1.5v AG10 battery (included). Large calculator with big buttons. Ideal for office or school. Auto power off. Square root key. Household Essentials. Ideal for School and office use. Large Calculator. Camping & Festival. Curtain Wire. Wild Bird & Wildlife. Art & Craft. Back to School. * Dual Powered With Solar Panel Or Battery * Angled Best View Display * Large Buttons For Easy Use * Perfect For Home, School Or Office * Battery Included * Package: Desktop Electronic Calculator x1 Type Calculators Sub-Type Desk Calculator with Tax Calculation Power Source Solar, Battery Features Without Print Option Display Size Large Key Size Regular Model 8 Digit Brand Unbranded MPN Does not apply UPC Does not apply EAN Does Not Apply. Desktop Calculator. Big Display. Two way power system. 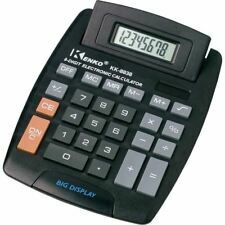 This jumbo desktop calculator is dual powered and operates on battery power for convenience. Requires 1.5v AG10 battery (included). Jumbo desk calculator. · Dual Powered With Solar Panel Or Battery. The jumbo desktop calculator is dual powered and operates on both. Jumbo Calculator. solar and battery power for convenience. Requires 1.5v AG10 battery (included). outside UK mainland. If for any reason you are not 100% happy we will gladly. The jumbo desktop calculator is dual powered and operates on both solar and battery power for convenience. Size Desktop. Power Source Battery, Solar. Key Size Large. Product Key Features. Display Size Large. Product Information. Jumbo desktop calculator is dual powered and operates on both solar and battery power. This battery powered Jumbo Calculator is constructed from durable plastic. More features: 8 digit display, auto power off, pivoting display, square root key.